Aft Skirt Hot Fire Test…Check! Today, Ares I-X passed another significant milestone when engineers and technicians successfully completed a hot fire test of the hardware at the Aft Skirt Test Facility at Kennedy Space Center. The hot fire test is actually a series of tests performed on the Aft Skirt –primarily the Thrust Vector Control (TVC) System. Before the test, the fuel systems are checked for leaks and filled with hydrazine (rocket fuel). The hot fire is a two-minute run of the Auxiliary Power Units (APU) using the hydrazine just as it would on launch day. The electro hydraulic servo-actuators, which control the direction the nozzle is pointing, are commanded to move to various positions to make sure they respond properly to commands. Additionally, the power units are run at 100%, 110% and 112% of capacity to assure that all redundancy modes are working properly. When the test has been successfully completed the hydraulic systems are left as they are and the hydrazine is taken out. The system will stay in that condition until the Ares I-X vehicle is at the launch pad where the system will be refueled with hydrazine in preparation for launch. 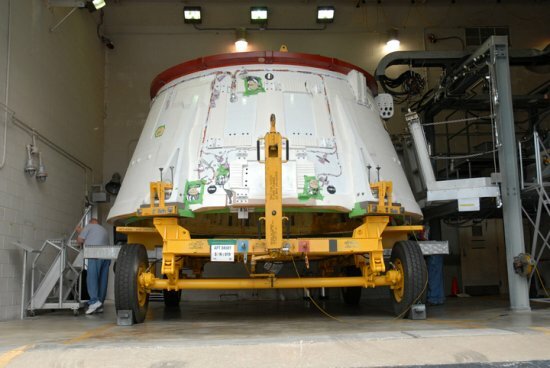 With this milestone complete, the aft skirt will be transferred to the Rotation Processing and Surge Facility next month and attached to the aft motor segment. When attached, these two pieces of hardware make up the aft assembly and will be the first hardware to be stacked on the Mobile Launcher Platform in the Vehicle Assembly Building when that process begins in June. Congratulations people on another successful test. You all make me pround to be an American and a NASA fan. Keep up the good work. That is great news..one step closer! Is there a differnece between the angle the nozzle is pointing and the effective angle of the thrust from the nozzle? If so, is the relationship between hardware and effective angles created from sub-scale test data? Previous Previous post: The Last Piece of The Rocket Has Arrived!